Hop in, buckle up, and hit the trail on a UTV ride in the Sonoran Desert, from Phoenix. Experience the dexterity of the Kawasaki Teryx4, a four-seater with electric power steering that can be filled to capacity and still climb trails, crawl boulders, and zip all over the desert without breaking a sweat. Pricing is per vehicle, based on a maximum of four people. After hotel pickup in Phoenix in the morning or afternoon, you're taken to a trailhead in the Sonoran Desert where your half-day expedition begins. Whether you’re craving adventure or simply want to sightsee at your own pace, this Kawasaki Teryx4 UTV is dialed in to deliver. With electric power steering, a thrilling V-Twin engine, and towing capacity to take everything with you, the exhilarating drive handles like a dream. The UTVs have been revamped to make your off-roading excursion the most comfortable. The tour operator has express permission from the Bureau of Land Management and the US Government/Tonto National Forest to operate tours in this region. 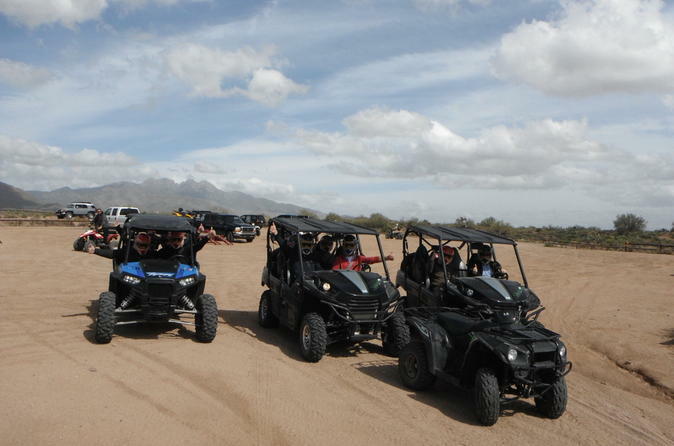 Your guided UTV adventure can operate on two main trails: Four Peaks and Rocks & Ruins. The route includes roughly 25 miles (40 km) of unmaintained off-road trails and may vary based on your driving ability. Your journey awaits where the pavement ends. ALL 4 SEAT UTVS!